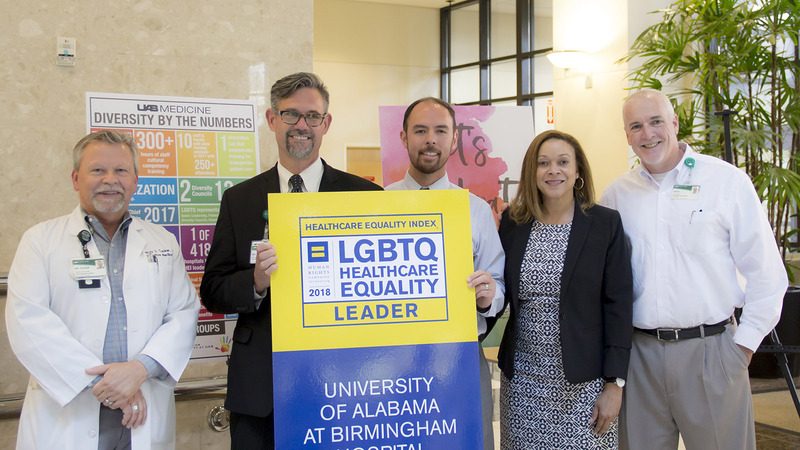 The University of Alabama at Birmingham (UAB) Hospital recently celebrated its third year earning the status of “LGBTQ Health Care Equality Leader” on HRC’s Healthcare Equality Index (HEI). UAB Hospital joins 417 other impressive healthcare facilities, including the VA Birmingham Medical Center of the Veterans Health Administration, in earning a perfect 100 on the 2018 HEI. Now in its 11th year, the HEI evaluates health care facilities’ policies and practices related to equity and inclusion of their LGBTQ patients, visitors and employees across the nation. A record 626 healthcare facilities actively participated in the survey, committing to LGBTQ-inclusive policies and practices. In 2018, the HEI evaluated more than 1,600 healthcare facilities nationwide. HRC Alabama State Director Eva Kendrick joined UAB leadership at its “Celebrate Equality” reception, praising UAB Hospital for its continued leadership in healthcare equality for LGBTQ Alabamians. HRC thanks UAB Health System President Dr. Will Ferniany; Chief Diversity Officer Deborah Grimes; Chief Operating Officer Reid Jones; UAB Medicine Director, Network Development and Affiliations Dawson Smith; and members of the HEI Advisory Team for their leadership in advancing LGBTQ health care equality in Alabama. For more information about HRC Foundation’s annual Healthcare Equality Index, visit hrc.org/HEI.